A fetching 1890’s brown cotton print one piece dress. The fabric has a white pattern. The bodice has a green velvet collar, front lapels and sleeve cuffs. 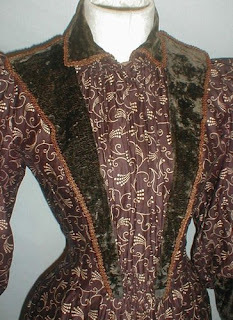 The velvet is outlined with light brown silk braiding. 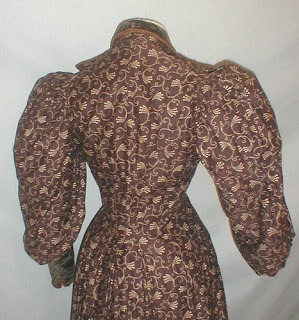 The bodice has full leg of mutton style sleeves. It is fully lined with cotton. The lining has a front button closure. 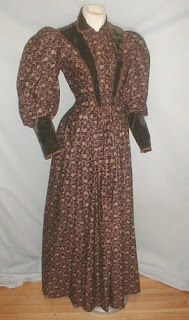 The dress is in very good condition. There are no splits or holes in the printed cotton or velvet fabrics. There is splitting on the inside lining mostly in the sleeves. A very pretty display dress. Bust 32 Waist 26 Length from shoulder to hem 52. 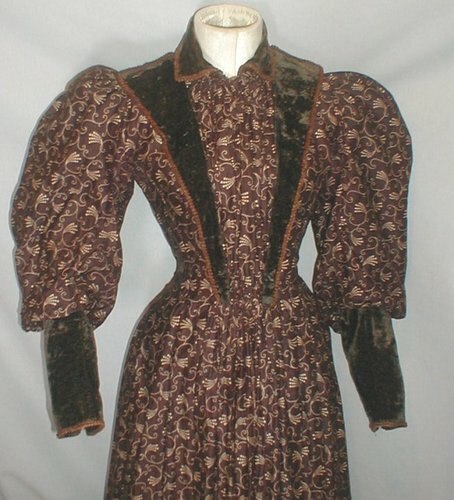 I kinda like the play of the velvet accents on this dress.